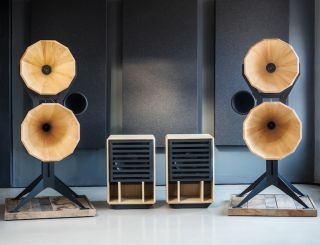 Oswalds Mill Audio Imperia is a $280,000 horn speaker | What Hi-Fi? If conventional speakers, with their drivers and grilles, just don’t cut it anymore, then take a look at OMA's Imperia, which uses horns to propel sound to your ears. Described as “the ultimate speaker from OMA”, the Imperia uses a four-way horn design, with a vertical array of conical horns. And it looks pretty crazy. OMA claims to be the only company using conical horns with straight edges, as it believes they don’t “deform the spherical wave of sound created by the horn”. The horns cover frequencies from 100Hz to 20kHz, while two rear-mounted subwoofer horns, using a 21in neodymium woofer, take care of low end frequencies from 20Hz to 100Hz. The two wooden horns are made from solid Pennsylvania Black Walnut, Cherry or Ash wood, and the midrange uses a Cogent DS1428 field coil compression driver. For the high frequencies, OMA has cast a horn from an aluminium alloy and the outboard crossover network is connected to the speaker via solid slate patchboard. The price for the ultimate speaker? You can nab a pair of these horned speakers now for $280,000.